The instrument, the “youngest” in the collection, is a fine example of an early modern grand. According to Herr Ingbert Bluthner, the firm’s current head, it is an example of their “Russian” model, designed to withstand climatic extremes. 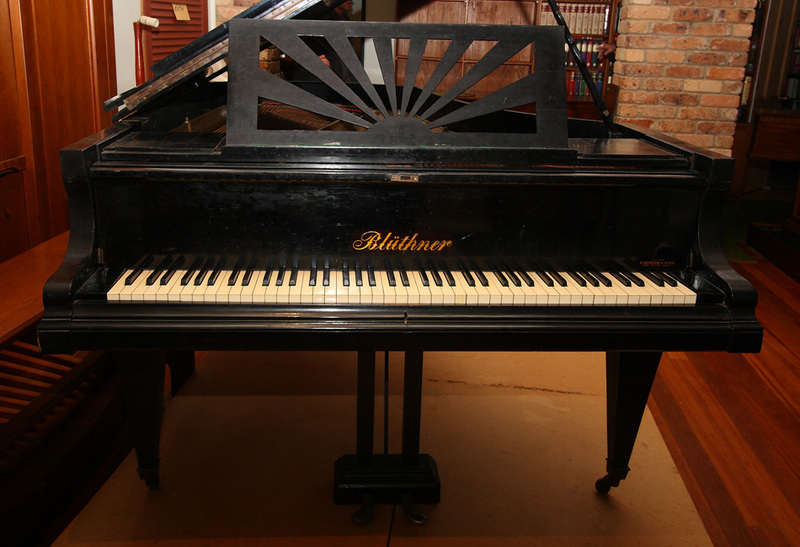 Notwithstanding the “art deco” music desk, lyre and legs, presumably added to give the instrument a “thirties” look, Herr Bluthner dates it to the mid-1860s, not long after Steinway’s introduction (1859) of the cross-strung, fully cast iron frame completed the evolution of the leather-hammered, short compass, straight-strung, timber-framed fortepiano into its modern descendant. It has a light action and a clear tone, making it especially suitable for both the classicism of Brahms and Satie’s asceticism, and reminding us that the romanticism of Liszt and his contemporaries was rendered on such instruments as these, not on the heavy-actioned, plummy toned instruments, eschewing clear fundamentals in favour of a “golden haze” of tone, into which they were later to evolve.